I’ve been trying to stay away from reading any new series until I finish the ones I’ve already started. However, I’ve been seeing “Stillhouse Lake” pop up everywhere lately, and after reading the description and a few reviews, I had to admit, I was intrigued. I decided I had to read it… and I’m really glad I did. Normally, Gina Royal is home at three in the afternoon, but her husband, Mel, has called and asked her to pick up the children as he has a work emergency. He was sorry to have disturbed her routine. He was kind that way, the “best, most charming man”. A great father to seven-year-old, Brady and ten-year-old, Lily. She’s looking forward to watching a movie with Mel and the kids that evening. Family time is one of Mel’s favorite things. His other favorite thing is spending time in his workshop, working on his projects. Gina never asks what he’s working on. When Gina gets back with the children, the street is filled with police cars, ambulances, and fire trucks. She sees that her bushes are flattened, as well as her mailbox. Then she sees the SUV embedded halfway into the garage—Mel’s workshop. Now Gina’s life is about to come crashing down around her. When she gives her name to the police their attitude towards her becomes aggressive. She thinks they must have her mixed up with someone else. She is read her rights and she feels like she’s in a nightmare….this can’t be happening. Then the police officer shows her the garage…and what Mel was really doing in his workshop….and she starts to scream. New Names, new state, new home, and a new life. They are definitely not in Kansas anymore. Gina Royal no longer exists…she’s now Gwen Proctor. And there are a LOT of differences between the two. Where Gina was weak and submissive, Gwen is strong and dominant. Gwen wants to set down some roots, give the kids a sense of stability and safety. She wants to leave Gina and everything else behind…The accident. The arrests. The trials. THE EVENT. However, there are people who just won’t let that happen. People who believe that she really was “Melvin’s Little Helper”. “The Sicko Patrol” is what they call Gwen’s daily internet searches. She needs to keep an eye on what’s being said about her and her children, in case the trolls aren’t just blowing off steam. She forces herself to read just how much people hate her and the vile things they say. But some are more dangerous than others…. All she wants to do is survive and keep her kids safe. She runs crisis drills. They have an escape plan. They have an alarm set at all times, and Gwen is armed to the teeth! Melvin is in jail but why does Gwen feel like things aren’t done? Well, this was quite a read! I’m surprised at how quickly I flew through this novel. I devoured it in just two days. There is some violence; I did have to skim a few parts, but not enough to spoil the book for me. 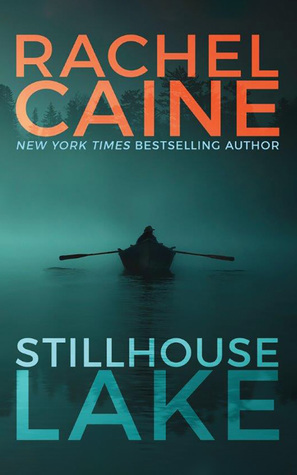 “Stillhouse Lake” is an intense and action-packed thriller. A dark and twisted story of betrayal and murder. The ending had me rushing to find book two of the series as I was desperate to find out what was going to happen next. Oh boy – I think I’m in! This sounds like a great story. Ooooh….Sounds intense! I love it! Must read! Thanks for sharing! Definitely! Looks like it’s not available at the moment, but I should have it by early February. I like the series. Glad to see that you enjoyed the first book. I hope that you will also like the second one, Killman Creek. Fab review. Thanks, Diana! I’m really enjoying book two as well! Great review. I loved this one. I want to read the next one soon, but have heard it is not as good. I shall see. Thank you! I’m actually reading book two now and it’s pretty good so far. I hope it continues. I hope you enjoy it if you decide to read it as well. It’s a really good series! I hope you enjoy it too!